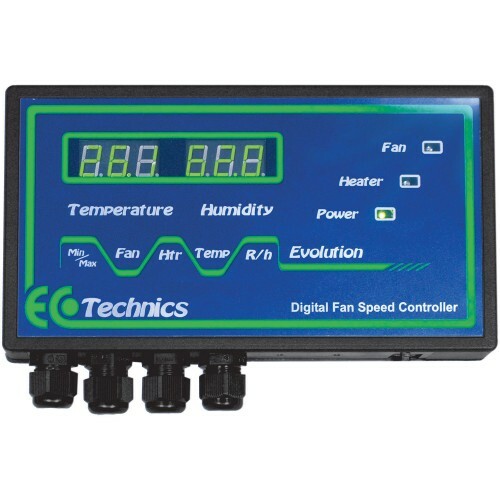 The Ecotechnics Evolution Digital Fan Speed Controller monitors temperature and humidity within the grow room and constantly adjusts the speed of the extraction/intake fans to maintain optimal conditions for plant growth. The unit also controls a grow room heater and is compatible with the Ecotechnics Evolution CO2 controller. This controller can control multiple fans through each channel up to a combined load of 6A (per channel). The heater output will control loads up to 3kW making it compatible with most fan heaters and all solenoid controlled gas heaters. The Evolution is a more expensive unit than some other options but has superior features and technology so the extra outlay is easily justified for those wishing to have maximum control over their environmental variables. - Dynamically adjusts fan speed with precise increments to control temperature accurately. - Intelligently responds to temperature changes. - Controls humidity as well as temperature. - Works in conjunction with the Evolution Co2 controller. - Able to control up to 3 kw of heating. - Both idle speed and maximum speed are fully adjustable. - Able to control two fans at the same time. - Remote temperature and humidity sensor with 5 metre of cable. Features:- Intelligent Multi Stage CO2 dosing- Fan Control- Bottled CO2 or Propane CO2 Generat..
Lighthouse 2500w Oil Free RadiatorThe Lighthouse 2500w Oil Free Radiator heats up rapidly and cools ..